Melt the butter in a pan. Place the biscuits in a polythene bag and crush with a rolling pin and add to the melted butter. Press the mixture into a 23cm flan or pie dish and chill whilst you prepare the filling. In a bowl beat together the eggs, add condensed milk and zest and juice of the oranges and lemon. Pour onto the biscuit base and then bake for 20 minutes or until the filling is firm. When cool spread top with crème fraîche and decorate with orange segments. 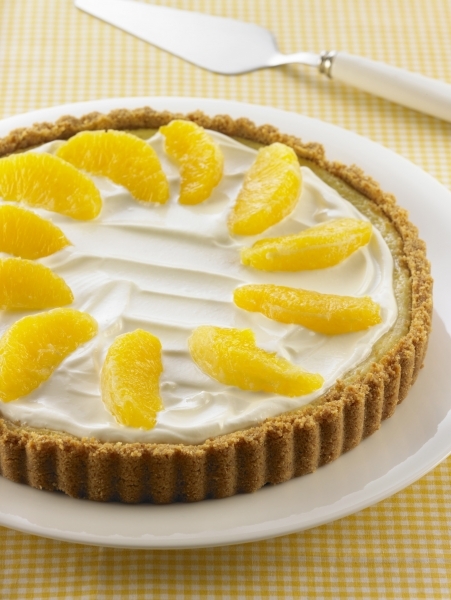 Try replacing the zest and juice of the oranges with lime to create a Key Lime Pie. For another alternative replace digestive biscuits with ginger nuts.